We’d love your help. 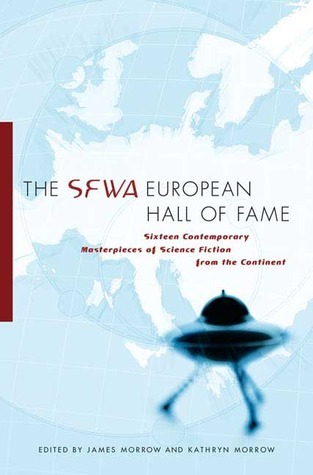 Let us know what’s wrong with this preview of The SFWA European Hall of Fame by James K. Morrow. This is the best book of its kind in at least two decades. It is a literate, intelligent book of powerful SF stories from across Europe. These tales are representativeof the best writers and stories of the last twenty years, written in most of the major contemporary European languages. The SFWA European Hall of Fame includes someof the biggest SF names in Europe, includ This is the best book of its kind in at least two decades. It is a literate, intelligent book of powerful SF stories from across Europe. The SFWA European Hall of Fame includes someof the biggest SF names in Europe, including Joanna Sinisalo, Andreas Eschbach, Elena Arseneva, and Jean-Claude Dunyach. The appeal of this anthology rests first upon the venerable SFWA Hall of Fame imprimatur, and secondly on the sterling reputation of co-editor/writer James Morrow. Morrow and his wife Kathryn spent years arranging for translations of the best in European SF, and working with translators to achieve sharp, polished, and entertaining English versions of the stories. To ask other readers questions about The SFWA European Hall of Fame, please sign up. Only a few of these stories were really brilliant (par for the course for most anthologies, really), but it's interesting to see what's happening in European SF. The mini-overviews from the introductions to each story are also useful in this regard. So far as I could tell (not having read the originals), all the translations were good. I thought that the stories by Johanna Sinisalo and Sergei Lukyanenko were probably the most gripping, but the one by José Antonio Cotrina was pretty interesting to Only a few of these stories were really brilliant (par for the course for most anthologies, really), but it's interesting to see what's happening in European SF. The mini-overviews from the introductions to each story are also useful in this regard. So far as I could tell (not having read the originals), all the translations were good. This review has been hidden because it contains spoilers. To view it, click here. Very good introduction to the science fiction writing going on in Europe, and which is often not translated into English. All the stories have something unique to offer and are enjoyable in themselves. The great care with which the stories were selected really shines. The best stories in the collection are: " 'Yoo Retoont, Sneogg, Ay Noo' " & "Wonders of the Universe". The second is about a dying astronaut taking stock of her life, and preparing for death amid the wonders of the universe. The Very good introduction to the science fiction writing going on in Europe, and which is often not translated into English. All the stories have something unique to offer and are enjoyable in themselves. The great care with which the stories were selected really shines. Some translated Euro shorts that us anglo-speakers don't normally see. There's a more open-ended, slightly pretentious woolliness to some of them that I found fairly annoying at the time, but several of them have stayed with me, so that can't be all bad. Others are just a bit silly, but short and sweet for all that. There are some that hit home or hold together though. The Danish offering about a past-seeded world and a couple doomed to solve its conundrum is very evocative & holds its tone w Some translated Euro shorts that us anglo-speakers don't normally see. There's a more open-ended, slightly pretentious woolliness to some of them that I found fairly annoying at the time, but several of them have stayed with me, so that can't be all bad. Others are just a bit silly, but short and sweet for all that. There are some that hit home or hold together though. The Danish offering about a past-seeded world and a couple doomed to solve its conundrum is very evocative & holds its tone well, which is impressive given it's a translation. Other decent ones include: A Russian service that exchanges your destinies; A Spanish university course on reading between the lines; A wormhole captain with a secret and a space-dancing stowaway; A love affair between time cops; & a world where rooms of sub-human mutants unknowingly compete to be the one that enters society. PS the Finnish one titled 'Baby Doll' is a thoroughly uncomfortable read, and until 9-yr-olds actually start getting implants, i struggle with its validity. The only unifying theme in this anthology is that the authors are European. Thus there is a wide variety of styles and themes, and the stories were probably chosen somewhat haphazardly, based in large part on who could be found to translate what into English. For me, most of these stories were just OK, but a few really impressed me. I am glad to see that some of the authors I already know from their writings in French, or their translations into French in Utopiae and elsewhere, are getting some The only unifying theme in this anthology is that the authors are European. Thus there is a wide variety of styles and themes, and the stories were probably chosen somewhat haphazardly, based in large part on who could be found to translate what into English. For me, most of these stories were just OK, but a few really impressed me. I am glad to see that some of the authors I already know from their writings in French, or their translations into French in Utopiae and elsewhere, are getting some exposure in English. I hope this leads to more translations of Dunyach (French), and Barreiros (Portugese), among others. The great new discovery for me in this book was Lucian Merisca. His satire was surprising and hilarious, even in translation from the Romanian. I spent hours trying to track-down the supposed "novel" of his that was mentioned in the introduction as being translated into French, only to eventually discover it was actually only a short-story (a "nouvelle", not a novel). I hope someone will find a way to get more of his stories available in English. Bella l'idea di dare risalto alla fantascienza europea (ma l'idea doveva venire per forza agli americani? ), l'antologia è godibile, ovviamente non ho apprezzato allo stesso livello tutti i racconti ma questo ovviamente dipende dal gusto personale. Baby doll (J. Sinislao), Pezzi di ricambio (M. S. Huberath), Sepultura (V. Evangelisti), Destiny Inc (S. Lukyanenko), Tra le righe (J. A. Cotrina) e Le meraviglie dell'universo (A. Eschebach). Tra i racconti Bella l'idea di dare risalto alla fantascienza europea (ma l'idea doveva venire per forza agli americani? ), l'antologia è godibile, ovviamente non ho apprezzato allo stesso livello tutti i racconti ma questo ovviamente dipende dal gusto personale. Athos Emfovos nel tempio del suono (P. Koustas), Prove di rivoluzione su Outrerria (L. Merisca) e Il pianeta muto (E. Arsenieva). A great collection of science fiction short stories (translated from the original) from a broad swath of continental Europe. I will definitely pick up other works by many of the authors included in this collection. This one is worth it for the story "A Birch Tree, A White Fox" alone, but there are some other gems as well. I remember reading in the introduction that the editors chose these stories very carefully, and I think it shows. Some truly excellent short fiction here. A really good European anthology, ideal to get a sample of the European way of doing SF. And the forewords by Jim an Kathy Morrow is a good introduction to the main themes and tropes in Europe. Definitely worth a try. Some stories were amazing; others were ok.
A little bit odder than your usual best-of collection. It's like science fiction as if it were written by the aliens. I enjoyed pretty well every story in this collection. Very good selections and a generally high-calibre of work. Not one dud in the bunch. Decent collection of translated contemporary Science Fiction. Some of the stories are quite good, some less so, all worth reading.